(1606 - 9 June 1647) Second son of George Calvert , brother to Cecil , and governor of Maryland from 1633 to 1647. He led the first expedition from England to the new colony; established good relations with the local Indians; selected the site of the capital at St. Mary's City; and attempted to execute the orders and designs of his brother amidst the almost constant hostility of the Virginians. He was out of the colony for almost two years following Richard Ingle's invasion of Maryland in 1645, but finally restored proprietary authority and died soon after. He made Margaret Brent, his sister-in-law, his executrix. (8 AUG 1605 - 30 NOV 1675) First son and heir of George Calvert , Cecil was raised a Catholic, attended Trinity College, Oxford, and in 1628 married the Catholic Anne Arundell (d. 1649). He inherited the title, Irish estates, and the 10-12 million acres of American land in what became Maryland from his father and served as the designer and first Lord Proprietor of that colony from 1632-1675. He never journeyed to America, but he skillfully preserved his charter rights from enemies over the course of several decades, established Maryland on a sound and prosperous footing to the depletion of his personal fortune, and consistently and innovatively promoted religious toleration for all Christians living in his colony. His son Charles (1637-1715) served as governor of Maryland from 1661 to 1675 and as second Lord Proprietor and third Lord Baltimore from 1675 to 1715. (11 Nov. 1600 - 30 Jan. 1649) Second son of King James VI of Scotland, later James I of England, he was not the heir apparent until the death of his older brother, Henry, Prince of Wales, in 1612. He was crowned king, following the death of his father, on March 27, 1635 and soon after married the Catholic Henrietta Maria, sister of Louis XIII of France. (1579 - Dec. 1656) Born in London, White entered a Spanish seminary, studied at the College of Martyrs' at Douai, France, was ordained a priest in 1605, and risked a cruel death during a period of renewed Catholic persecution by becoming a missionary to Protestant England. (ca. 1580 - 15 April 1632) The oldest son of an obscure Yorkshire gentleman, George Calvert used ability and an Oxford education to gain wealth, status, and influence in the England of his time. Knighted in 1617, and a member of Parliament for Yorkshire in 1621, Calvert served as one of James I's two secretaries of state and a Privy Councilor from 1619 to 1625. (1601 - 1671) Born to a gentry family, she was Cecil Calvert's cousin. She immigrated to Maryland in 1639, as a thirty-eight year old spinster, with her sister Mary (? - 1658) to join brothers Fulke (? - 1656) and Giles (1600 - ca. 1672), who were soon to be very influential in Maryland affairs. Margaret and Mary patented 'Sisters Freehold' near St. Mary's City upon arrival and soon became dominant and wealthy planters. 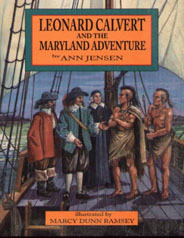 As Leonard Calvert's executrix, she administered his estate and performed essential government services at a crucial time for the colony. On 24 June 1648, she petitioned the assembly for a sear and two votes -- one as Calvert's agent and the second as a landowner -- but she was denied admission to the legislature, even though her male contemporaries praised her abilities. Often called the 'first suffragette,' Margaret removed to the Northern Neck of Virginia in the 1650s and established yet another large and thriving plantation, called 'Peace.' She died, unmarried, in 1671. The Project is sponsored by the Archeological Society of Maryland, the Society for the Restoration of Port Tobacco, the Southern Maryland Heritage Area Consortium, Preservation Maryland, and Preserve America. (? - 1695) Nuthead established the first printing press in English America south of Massachusetts at St. Mary's City in 1684 or 1685. Not much is known of his early life until he arrived in Virginia in 1682. Denied the opportunity to pursue his profession there, he came to Maryland. The earliest extant example of his work is a bill dated August 31, 1685, and one of his most important publications was a broadside (dated August 1689) that defended the Protestant overthrow of Lord Baltimore's government the same month. He died about the time the capital moved from St. Mary's City to Annapolis, and his wife Dinah followed the government to the banks of the Severn River and continued to operate a printing shop for many years. Four pieces of printing type, dating from Nuthead's era, have been excavated along Aldermanbury Street in St. Mary's City.